Oman Air’s mouth-watering First Class and Business Class inflight dining has been praised to the skies by readers of US-based luxury food magazine Saveur. The national carrier of the Sultanate of Oman has scooped the Readers’ Choice Award in the magazine’s annual Culinary Travel Awards, beating many of the biggest names in global air travel. “We are delighted that our First Class and Business Class inflight cuisine has won the praise of Saveur’s readers. 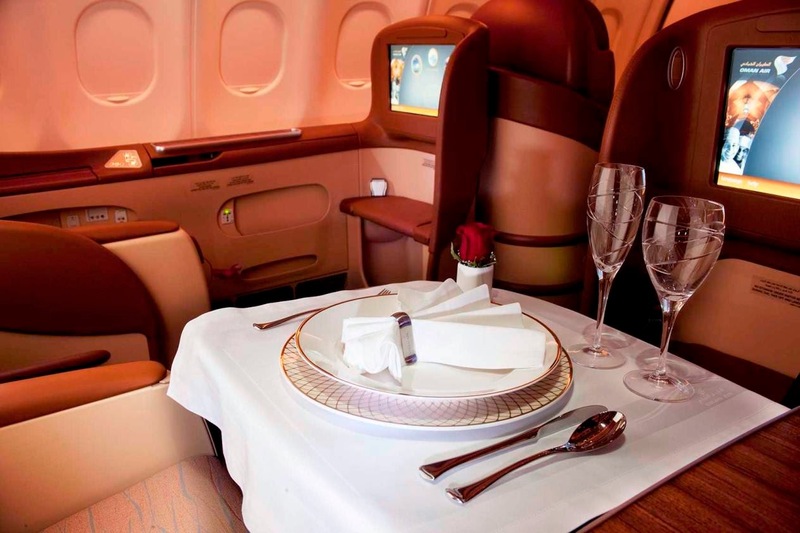 Oman Air prides itself on the extremely high standards of our inflight dining. Saveur’s readers were particularly impressed with Oman Air’s long haul dining, with the daily Heathrow to Muscat route being singled out for praise. The magazine’s description of First Class dining on this route includes a starter of caviar and champagne, followed by canapés, appetizers such as a winter pumpkin and apple soup, and entrées such as poached fillet of beef, Loch Fyne salmon, pan-fried sea bass and saffron risotto with grilled asparagus. Saveur magazine has a circulation of 325,000 and draws nearly two million unique visitors to its website every month. It offers readers information about food in all its contexts, emphasising heritage and tradition, home cooking and real food, and evoking flavours from around the world. Coverage of Oman Air’s success in the Readers’ Choice category of the Culinary Travel Awards can be found at http://www.saveur.com/content/culinary-travel-awards-2014-winners-best-in-flight-dining-first-business-class. The airline currently operates direct international flights from Muscat to Abu Dhabi, Bahrain, Doha, Dubai, Jeddah, Riyadh, Dammam, Madina, Tehran and Kuwait, in the Gulf region, as well as Cairo, Beirut and Amman within the wider Middle East region. In addition, Oman Air flies to ten destinations in India (Mumbai, Chennai, Kochi, Thiruvananthapuram, Hyderabad, Delhi, Lucknow, Bangalore, Kozhikode and Jaipur), Chittagong in Bangladesh, Karachi, Islamabad and Lahore in Pakistan, Kathmandu in Nepal and Colombo in Sri Lanka. Oman Air also flies to the Maldives, Bangkok and Kuala Lumpur, Zanzibar and Dar Es Salaam. Its European destinations are London, Milan, Munich, Frankfurt, Paris and Zurich. Oman Air also has codeshare partnerships with Emirates Airlines, giving travellers better connectivity and an extended range of services between Dubai and Muscat, as well as with Qatar Airways allowing Oman Air’s customers to book flights from any of the 43 departure points within its network to Doha. In addition, Oman Air, has a codeshare partnership with Ethiopian Airlines on the Muscat and Addis Ababa sectors, as well as codeshare agreements with Royal Jordanian, enabling that airline’s customers to fly with Oman Air between Muscat and Amman and Oman Air’s customers to fly with Royal Jordanian between Amman and Beirut. A partnership with Turkish Airlines allows passengers to book with either airline to fly between Muscat and Istanbul, with the flights being operated by Turkish Airlines. A further codeshare agreement with Sri Lankan Airlines offers Oman Air’s customers the opportunity to book seats on Sri Lankan Airline’s services from Muscat to Singapore, Male, and China via Colombo. In turn, Sri Lankan Airlines’ customers are able to book onto Oman Air’s flights from Colombo to Zurich via the Omani Capital of Muscat. Oman Air’s fleet currently consists of four Airbus A330-200s, three Airbus A330-300s, 17 Boeing 737-700s/800s, four Embraer E175s and two ATR 42s. Six Boeing 787 Dreamliners are on order for delivery from 2015, three Airbus A330s are expected from December 2014 and six Boeing 737-800s will be added to the fleet, also from 2014. In addition, Oman Air has six Boeing 737-900ERs on order, and will be the first Gulf carrier to take the aircraft. By 2016, Oman Air’s total fleet size is expected to be around 50 aircraft. Oman Air’s outstanding aircraft interiors include its First Class Mini Suite, which provides each of the six First Class passengers with direct aisle access and converts to the longest lie-flat seat in the skies. The A330’s 20 award-winning Business Class seats each provide direct aisle access, ample storage space and the latest technological amenities. Economy Class seats offer adjustable head and leg rests, together with generous leg and elbow room. A state of the art in-flight entertainment system features individual seatback screens, audio and video on demand and live satellite TV. In addition, Oman Air has pioneered both mobile telephony and Internet connectivity on board its flights and this is available in all three classes. Superb new First and Business Class lounges have been opened at Muscat International Airport, featuring elegant and tranquil relaxation areas, complimentary spa treatments and à la carte dining. A lounge-to-aircraft limousine service is also offered to First Class passengers at Muscat. Oman Air’s commitment to quality, comfort and a seamless passenger experience has resulted in international acclaim, including: Best Business Class Seat in the World (Skytrax World Airline Awards 2011, 2012); Service Excellence, Middle East (Skytrax World Airline Awards 2011); Best Luxury Airline, Middle East (Business Destinations Awards 2011, 2012, 2013); Best In-flight Connectivity & Communications award in The 2011 Passenger Choice Awards; as well as recognition in the TravelPlus Amenity Bag Awards 2010 (three Gold, one Silver), 2011 (two Gold, one bronze), 2012 (one Gold) and 2013 (one Gold); the Business Traveller Cellars in the Sky Awards 2010 (Silver) and 2012 (two Gold). Over the last year, Oman Air has also won two awards at the Arab Tourism Media awards, and three categories of the Oman Web Awards, was named Best Business Class Airlines – Middle East and Best Economy Class Airline – Middle East at the World Travel Awards 2014, and was ranked highly in the American Express Executive Travel magazine’s list of the world’s best airlines, Business Insider’s World’s Best Airlines 2014 and Bilanz magazine’s Best 25 Airlines 2014.